On Saturday, we slept in and relaxed in the morning before we headed out to do some wine tasting. We had planned to do some hiking while we were in Chelan, but the air was still so smoky that it would have been impossible. I have asthma, and that would not have been a good idea for me to be breathing in all the smoke, which hung visibly in the air, giving it a dirty orange color. 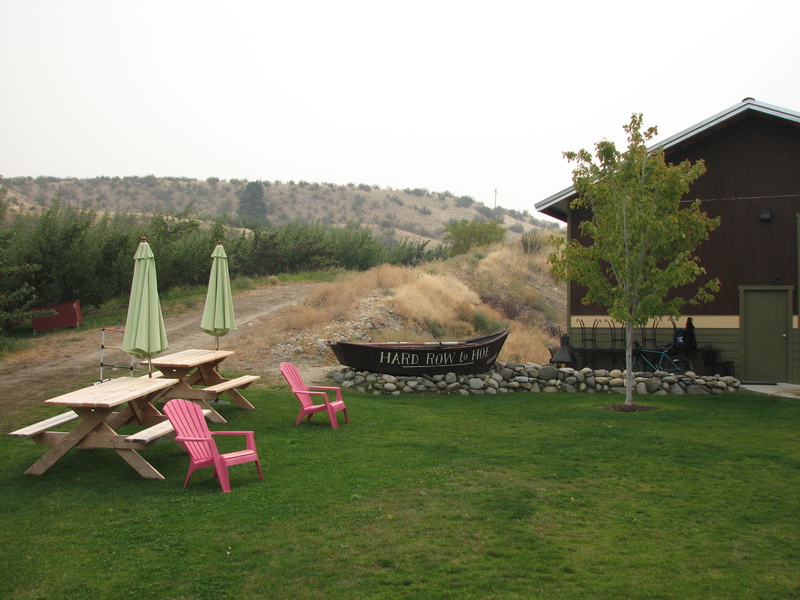 We got moving (at a leisurely pace) and decided that we would head out to Manson, which is about seven miles from Chelan, and where a lot of the area’s wineries are. Our first stop of the day was at Hard Row to Hoe Vineyards. This place is fun – taking its name from one of the more colorful parts of the area’s history. Back in the day, the 1930s to be more precise, construction on the Grand Coulee Dam was shutting down, and hiring was picking up at the Howe Sound Mine. The mine produced mostly copper, but also gold, zinc and silver. A group of enterprising “professional” ladies, who had been working down at the dam, decided to move into an abandoned lodge at Point Lovely, a couple of miles up the lake from the Howe Sound Mine. So, one of the locals opened up a water-taxi business, rowing men from the mine the few miles up to the lodge. Hard Row to Hoe – get it!? The tasting room capitalizes on the story, featuring photographs of Victorian prostitutes and with a space decked out in velvet wallpaper, beaded lampshades and a beautiful velvet upholstered settee. If you haven’t heard the story when you arrive, they are happy to tell you the juicier details. And even their website gets into the act, featuring a graphic of a man rowing a rowboat across the water, and topped with Mae West quotes on every page. Ah, but enough about the story, you want to know about the wines, right?! We started off with the Shameless Hussy Rosé. It is a blend of Pinot Noir and Sangiovese that is off dry and with just a hint of sweetness. I really liked this wine, but Jon always tells me I have too much Rosé. What? I don’t understand what that even means! Then we tried the Marsanne, which is not often done as a single varietal wine. The wine had flavors of lemongrass and oak, and the server explained that it was aged in a neutral oak barrel. The tasting notes say it tastes of honey and grapefruit – I didn’t really get citrus flavors out of this wine, but who knows, my sniffer might have been off because of all the smoke in the air. Jon liked this wine quite a bit, but I prefer a less oaked white wine. I should mention it won Gold at the Seattle Wine Awards. Next up was the Semillon, a crisp wine with a light butter flavor. It was very nice. I can’t tell you any more about it, because it is not mentioned on their website. Then came a Cabernet Sauvignon, with light tannins. It was a very laid back Cab, with the grapes coming from the Wahluke Slope in the Columbia Valley. The Wahluke Slope has about 15% of the grape acreage in Washington State. I liked it, but Jon likes a bigger, bolder Cab – this one was softer, with a more widespread appeal. Their 2008 Lickety Split is a blend of two different Syrahs and a Primitivo. All the grapes for this wine are also brought in from the Wahluke Slope. It is a smooth balanced wine that is perfect to drink now. A wonderful wine, but priced a bit high for my taste. The 2007 Primitivo, again with grapes grown on the Wahluke slope, is also very smooth, with light tannins and blackberry flavors. There wasn’t a bad wine in the bunch here – just some that were more my taste or Jon’s. It was a real treat to try Primitivo grapes fresh from the cluster, because they were doing crush right outside! The grapes were very sweet – sweeter than I was expecting them to be. 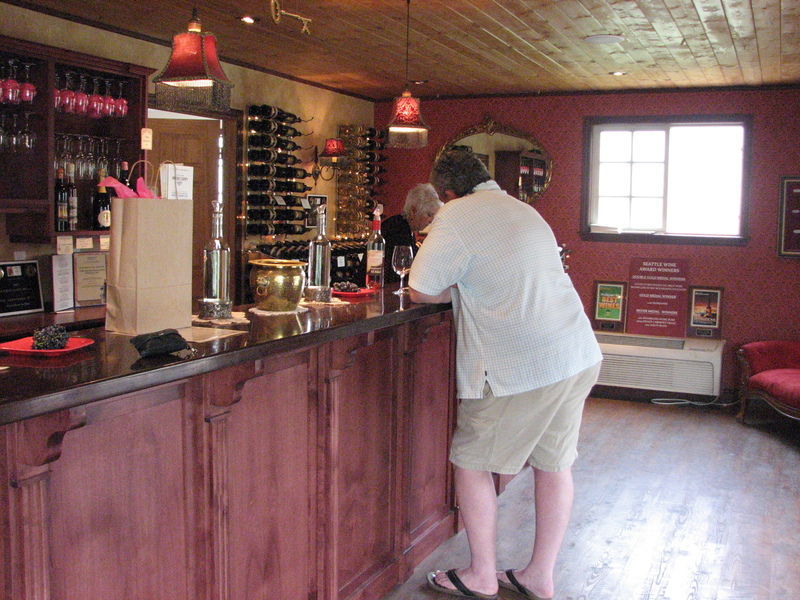 And the tasting room staff were fun and friendly, and were willing to give lots of information about the wines. We came home with three wines and they are just waiting for the right night to open them! Hard Row to Hoe Picnic Area – It would be a great day if not for the smoke in the air! After Hard Row to Hoe, Jon and I decided to try Atam Winery. Atam Winery is one of the areas only estate wineries – growing their grapes and producing the wine on site (more on estate wineries in an upcoming post). It is close by, and a guy I met at the conference said that he had been there with his family the night before and was pleased with it. So off we went. It is up a huge hill, with vineyards and a horse pasture in front of the winery. The winery is the lower floor of a home built into the hill, and the day that we were there, the tasting room door was fully open onto a big patio where you could sit and enjoy a glass of wine. But unfortunately, the experience went downhill from there. There were the birdscarers… I know they want to protect the grapes and all, considering it was really close to harvest, but trying to enjoy wine while a sonic boom goes off outside every 15 seconds is just impossible. Jon thought they were gunshots, and was having all sorts of thoughts of crazy Eastern Washington folks shooting their guns off everywhere! And then, the server was a bit stiff. She poured the red wine, a Barbera, first and said that since the wines were made in the German style, they sampled the red wine first, like the Germans do. But that was all the information she offered up. She didn’t tell us why the German style wines should be sampled in that order. She didn’t explain why or how a Barbera, which is an Italian grape, was being made in the German style. She didn’t say anything about any of the wines! So I’m left wondering if what she said is true, that the Germans do their wine tastings with the reds first. If you know the answer please let me know. And if you know why – even better! So, we tried the Barbera – it had a slight foam on top which was strange -the wine was so-so. The Riesling we tried next was sweet but flat, and had no acidity to balance it out. The Gewürztraminer was like grape juice; it had no structure. I didn’t like any of the three, so I won’t delabor the point with any more detail. At that point, Jon just wandered off, out to the patio and then further away… I knew he wasn’t coming back. What to do now!? I hate leaving a winery without making a purchase, because these are generally small businesses, and people’s livelihoods, but I really didn’t like any of these wines… I said thank you and departed, and then chastised Jon when we got back in the car for bailing on me! And I certainly won’t be taking anymore wine recommendations from my conference friend!